Tom Waits is set to release this year, newly remastered versions of each of his acclaimed albums in the Anti- catalogue. In addition, the album 'Real Gone' has been fully remixed and individual releases of each of the 3 discs of 'Orphans: Brawlers, Bawlers & Bastards' will be available early 2018. Remastering significantly improves the quality of sound files and restores the integrity and intent of the original recording. Tom Waits and Kathleen Brennan personally oversaw this process for both the vinyl and digital formats of the catalogue. The albums roll out beginning November 2017 and continue through December. All albums will be available on 180-gram vinyl. The first to be released is the Grammy-nominated album 'Bad As Me' (2011). These songs were designed to be lean and mean, with strong hooks and tight running times. From the opening horn-fueled chug of 'Chicago', to the closing barroom chorale of 'New Year’s Eve', 'Bad As Me' displays the full career range of Waits’ songwriting, from beautiful ballads like 'Last Leaf' to the avant cinematic soundscape of 'Hell Broke Luce' a battlefront dispatch. Waits worked with longtime co-writer and producer Kathleen Brennan, in addition to Waits’ veterans; Keith Richards, Marc Ribot, David Hidalgo, Larry Taylor and Casey Waits. 'Mule Variations' (1999) The Grammy award winner for Best Contemporary Folk Album, and Certified Gold Record, offers the iconic songs 'Hold On' and 'What’s He Building in There' along with the groove-heavy, 'Get Behind The Mule'. Experimentation are interspersed with some of the most beautiful and personal songs Waits has written. 'Blood Money' (2002) Based on the true story of Woyzeck, a conscripted German soldier, who murders the mother of his child after being driven mad by army drug experiments. This is a darkly rhythmic record, illuminating life’s bleak carnival with songs like 'Misery is The River of the World”'and 'God’s Away on Business' and includes the melancholic beauty of 'All the World is Green' and 'The Part You Throw Away'. Marimba, bass clarinet, trumpet, viola, cello, calliope and log drums form the core group of instruments. 'Alice' (2002) Alice is a haunted, moody chamber piece devoted to the obsessive, forbidden love of Charles Dodgson for Alice Liddell, for whom Alice in Wonderland was created. Piano, pump organ, cello, theremin and stroh violin are the main instruments employed for these melancholy and comic musings on death, longing, and the random meanness of life. 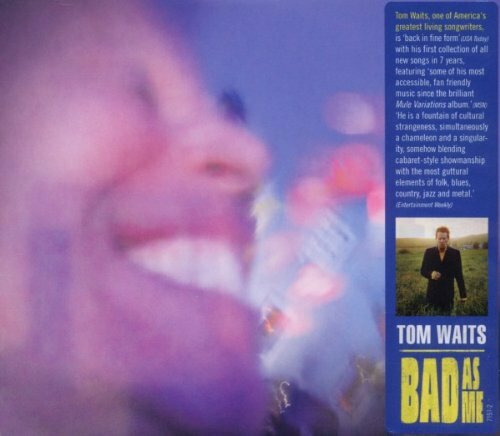 Waits adapts the classic blues jazz balladry his early career in the eponymous song, 'Alice' and the seasick pump organ and strings ode to the wall that separated East from West Germany, 'Lost in the Harbor'. 'Real Gone' (2004) Grammy nominated and featuring an entirely new mix that better fulfils the dynamic musical soundscape Waits/Brennan envisioned from the beginning. To accomplish this they returned to the multitrack session tapes and enhanced certain instruments or a vocal arrangement to create a sound that better represents the full-bodied more sonically vibrant and jagged edges that Waits and Brennan were originally going for but lost. 'Orphans: Brawlers, Bawlers & Bastards' (2006) This Grammy Nominated, Gold-certified three-disc set will be offered as separate records for the first time. The collection goes beyond a simple career retrospective with over 30 newly recorded songs and unique interpretations of songs by a diverse group of artists which include The Ramones, Daniel Johnston, Kurt Weill & Bertolt Brecht and Leadbelly. 'Glitter and Doom Live' (2009) Disc one captures 17 performances hand-picked by Waits from his sold-out 2008 international tour. The collection features a haunting 'Trampled Rose' from Real Gone and a hypnotic 'Get Behind the Mule' from Mule Variations. Waits also digs into the vaults for tracks like a reimagined 'Singapore' from 1985’s Rain Dogs. The second disc, 'Tom Tales', features a selection of the comic bromides, strange musings, and unusual facts that Tom traditionally shares with audiences.